Riffle Sample Divider for Sampling Aggregates, Testing Lab Equipments Manufacturers for Aggregate Testing Lab - Used for sampling Aggregates, technical teaching equipment for engineering, Ores, Refractory. 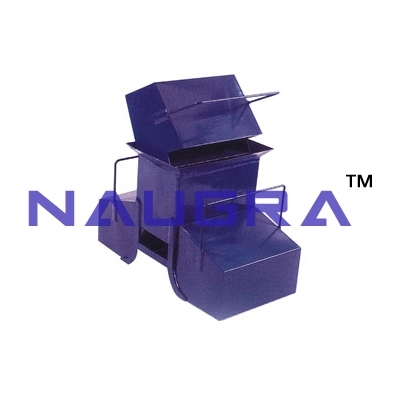 It consists of a sheet metal box mounted on Legs and fitted with a series of chutes of equal width which discharge the material alternatively in Opposite Directions into separate pans. The chutes of the Riffle are steep enough to allow rapid flowing of the Materials. The instruments has 14 Nos. Chutes of 13mm width and is complete with receivers..
We are leading manufacturers, suppliers & exporters of Riffle Sample Divider for Sampling Aggregates, Testing Lab Equipments Manufacturers for Aggregate Testing Lab. Contact us to get high quality designed Riffle Sample Divider for Sampling Aggregates, Testing Lab Equipments Manufacturers for Aggregate Testing Lab for schools, colleges, universities, research labs, laboratories and various industries. We accept bulk orders for government tenders in all countries around the globe.